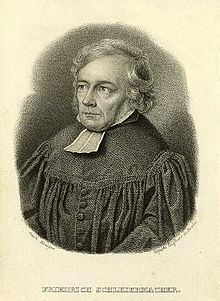 Friedrich Daniel Ernst Schleiermacher (German: [ˈʃlaɪɐˌmaχɐ]; November 21, 1768 – Februar 12, 1834) wis a German theologian, filosofer, an biblical scholar kent for his attempt tae reconcile the creeticisms o the Enlichtenment wit tradeetional Protestant Christianity. ↑ Kristin Gjesdal, Gadamer and the Legacy of German Idealism, Cambridge University Press, 2012, p. 156. ↑ Paola Mayer, Jena Romanticism and Its Appropriation of Jakob Böhme, McGill-Queen's University Press, 1999, p. 101. ↑ Friedrich Schleiermacher, Hermeneutics: The Handwritten Manuscripts, ed. by Heinz Kimmerle, trans. by James Duke and Jack Forstman (Missoula: Scholars Press, 1977), p. 196: "just as the whole is understood from the parts, so the parts can be understood from the whole. This principle is of such consequence for hermeneutics and so incontestable that one cannot even begin to interpret without using it." ↑ Anthony C. Thiselton, New Horizons in Hermeneutics: The Theory and Practice of Transforming Biblical Reading, Harper Collins, 1997, p. 214. ↑ 9.0 9.1 Friedrich Schleiermacher, "Ueber den Begriff der Hermeneutik mit Bezug auf F. A. Wolfs Andeutungen und Asts Lehrbuch", lecture delivered on 13 August 1829; published in Friedrich Schleiermachers sämtliche Werke III/3, 1838 (Schleiermacher makes reference to Ast's Grundlinien der Grammatik, Hermeneutik und Kritik (1808) and Wolf's Vorlesungen über die Enzyklopädie der Altertumswissenschaft (1831)); Richard E. Palmer, Hermeneutics, Northwestern University Press, 1969, ch. 6. This page wis last eeditit on 22 November 2017, at 20:26.